In this delightful early science fiction children’s book, we are introduced to space travel, impossible in 1954, and of course, becoming quite possible only a decade later. One of the fascinating elements of “The Wonderful Flight to the Mushroom Planet” is how accurate the science is, given that we had not yet landed on the moon. While the description of the Mushroom Planet itself is a bit far-fetched, everything about space travel to get there feels pretty accurate. For children who enjoy space and imagination, with a little bit of education thrown in, the Mushroom Planet children’s book makes a great entry. It is easily read by 8-year-olds and up. The plot is exceedingly simple, and the story moves quickly. There are a few morals along the way as well. 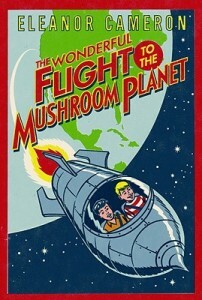 For example, what would become of the Mushroom Planet if everyone began to go there as a tourist? I enjoyed this children’s book from start to finish, and felt quite satisfied at the end. There is at least one other children’s book about the Mushroom Planet and it’s people, but I am not drawn to read it or review it. It feels like one of these is enough. I do recommend the book particularly for boys who are interested in science.